Sir Elton John's musical biopic Rocketman, is to be set to his greatest hits. The 64-year-old singer-songwriter - who won a piano scholarship to the Royal Academy of Music at 11 and is now a chart-topping superstar - is teaming back up with Billy Elliot playwright Lee Hall to write a film about the story of his life. Steve Hamilton Shaw, who is co-producing with Elton and David Furnish, told Deadline.com: "Rocketman will be a radically different kind of biopic. "It will be as unique as Elton's life, told in a non-linear and hyper-visual manner that will transport people through the many intense experiences, some wonderful, some not, that helped define Elton as an artist, musician and man." The film is set to use Elton's greatest hits to drive the story of his chart success self-discovery, with choreographed sequences using the famous tunes. 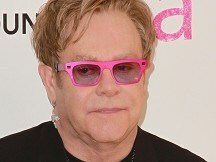 Elton revealed earlier this year: "It will be more of a fantasy - Moulin Rouge type of stuff. Obviously, it's not going to be your normal, run-of-the-mill film. "My life's been so surreal, from buying a football club to God knows what." The film is now seeking a director and an actor to play Elton, with the possibility of different actors playing him at different stages of his life. This is not the only musical biopic currently in production. Award-winning writer Peter Morgan has penned a film about Queen frontman Freddie Mercury, set to star Sacha Baron Cohen.